A couple of years ago I highlighted the the spending by Tower Hamlets council on a fairly useless communications tool called My Tower Hamlets. It was designed by Captive Minds, a company that has had a long and fruitful relationship with the council’s head of communications, Takki Sulaiman, both during his time at the town hall and previously when he worked for Cafcass. It sends out thousands of text messages to people…at a cost to the people. This one has just been sent tonight. 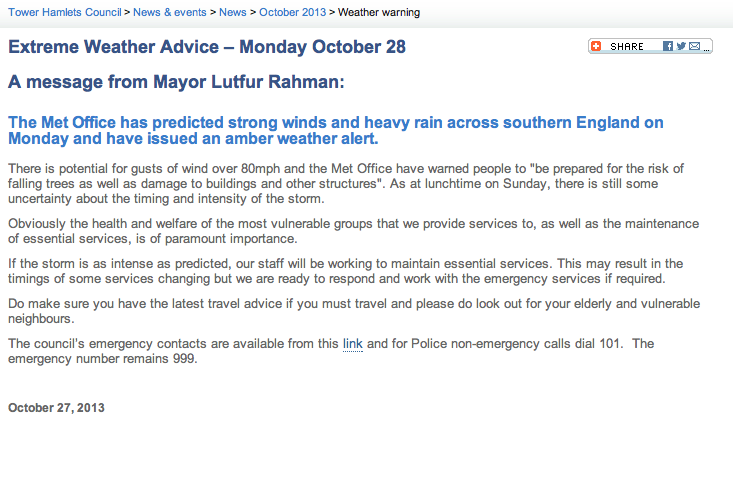 Message from Mayor Lutfur Rahman: Take care during the stormy weather. See [link] for info, contact number and advice on council services. Of course, there’s no harm in the council issuing warnings and advice like this…but why does Lutfur feel the need to personalise it? Can you imagine a Mayor John Biggs have the brass neck, the lack of humility to do something similar? If there are storms, expect Lutfur out and about in his Merc tomorrow. With an East End Life photographer in tow. Truth is Lutfur is a bit of a drama queen. Should the Met Office have made a mistake and the expected storm doesn’t hit London then we can doubtless expect text messages extolling Rahman for personally averting the carnage. The sadness of his ego-centricity is matched only by the sadness of those who voted for him. The word ‘despicable’ doesn’t begin to describe it. Ted, joking aside – this is yet again another example of the resources of tower hamlets council being used to publicise the “dear leader”. but anyway, who would go to the LBTH website or Lutfur’s blog when wanting information about the weather? Are there any people who use LR’s blog or the LBTH website as their sole source of information… despite my cynicism I think not. on October 27, 2013 at 9:51 pm Andrew W.
I got the message at 8.37pm which is a bit late given that the warnings have been available on other news media for days. I wonder why they left it so late? I think if there is real damage in TH that we should ask him why he sent the warning so late that most people would have not had time to prepare or might have even gone to sleep given the clock change this morning. Reckless negligence in my opinion risking the lives of his residents by informing them so late in the day. This “despicable” drama is working well with certain voters; Just to add, you should know that he was also out in Whitechapel saying he will do everything to help those who got caught and then said the UKBA should not be coming around like this with out proper intelligence! But he did not say why the council officers were there with the UKBA? Sounds like a hypocrite; but hey, again it is working, it seems on the face that Lutfur is standing for those that can’t!! Do you ever wonder how it all works. The internal process. 2. Let’s text people from Tower Hamlets to warn them. 3. Better put LR’s name on it because he might get annoyed with us. 2. The hoardings sporting his picture might get blown over. NOW WHAT!?! 4. Let’s send out text messages and on the day take pictures of him holding back the mighty storm! 5. Blame the local Labour Party for bringing the storm to tower hamlets for provoking the EDL into performing the storm dance! It’s called the mayoral system. Exactly what Blair had in mind. Council run by recognisable public figurehead, and policy and operations associated with him/her. So if they’re good policies voters know who to reelect and if they’re bad, they know who to boot out. I for one reckon that come 2014, those in the latter camp will prove to be a minority. Rubbish. There is a mayor for the whole of London and often posters and messages with a ‘Mayor of London’ logo on it but not even Boris has the audacity to stick his own face on, and try to take credit for, everything the authority does. Sadly I fear you’re right on the last point. Thank goodness for postal votes eh. On the contrary it was an extremely useful tool. The entire costs – initial and subsequent operating costs – were and are unknowingly paid by the dumb people of Tower Hamlets. The council tool was designed to increase the council’s ability to mislead, confuse and brainwash the public into believing Tower Hamlets council is astonishingly wonderful. No wonder you decided to evacuate your household from the cesspit of corruption, dodgy-deals, frivolous wasting of public dosh and oodles of double-speak. Did you miss-out, inadvertently perhaps, the bit about the wonderful mayor offering to all the pensioners and disabled residents his limo to ferry them about during and after the storm ? Surely that was the reason for the last minute helpful announcement from The Mayor ? Not all people in Tower Hamlets are dumb. I feel that using the word DEAR in the phrase “dear leader” is a mistake as it connotes expensive leader. It appears to me that Lutfur and Sir Robin Wales sing from the same songsheet when it comes to self-promotion… you’ve doubled your work-load by moving to Newham Ted! He can do ANYTHING with his infinite and bewildering talents! Always ready to give a friend some cash or dispense crucial advice! Super Lutfur says: always tell your mother when you go off somewhere! Super Lutfur says: Don’t do stuff that irritates your inner ear! Super Lutfur says: Remember to wipe twice! Lutfurs’ tasked the faithful to recruit at least ten in number residents from each estate under Poplar Harca stewardship, seems the frivolous wasting of public dosh is not a monopoly. I thought texting was free after initial setup costs? If it’s cheap or free I don’t see a problem, they should utilise the service more widely.